Clinical Endocrinology of Companion Animals offers fast access to clinically relevant information on managing the patient with endocrine disease. Written by leading experts in veterinary endocrinology, each chapter takes the same structure to aid in the rapid retrieval of information, offering information on pathogenesis, signalment, clinical signs, diagnosis, differential diagnosis, treatment, prognosis, and prevention for a broad list of endocrine disorders. Chapters begin with brief summaries for quick reference, then delve into greater detail. 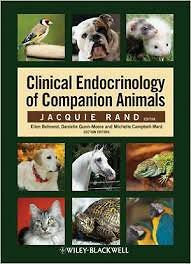 With complete coverage of the most common endocrine diseases, the book includes chapters on conditions in dogs, cats, horses, ferrets, reptiles, and other species. Clinical Endocrinology of Companion Animals is a highly practical resource for any veterinarian treating these common diseases.